^1 French Land Register data, which exclude estuaries, and lakes, ponds, and glaciers larger than 1 km². The department is part of the current region of Provence-Alpes-Côte d'Azur. It is surrounded by the departments of Gard on the west, Vaucluse on the north, and Var on the east, and by the Mediterranean Sea on the south. The Rhône river delta forms a vast swampy wetlands area called the Camargue in the southwestern part of the department. Bouches-du-Rhône is bordered by the Rhône to the west and the Durance to the north. The Rhône divides into the Grand Rhône and Petit Rhône south of Arles; the area between forms the Camargue, a large wetland. The principal mountains of the department are the Sainte-Baume massif (1,042 metres – 3,418 feet), Mont Sainte-Victoire (1,011 metres – 3,316 feet), the Garlaban massif and Alpilles massif. The department's prefecture and largest city, Marseille, contains a major industrial harbour and serves as France's largest commercial port. The Bouches-du-Rhône department is largely urban, with 28 towns having a population of more than 10,000 as of 2008. The department of Bouches-du-Rhône is also known for its seismic activity: the zone II ("average seismic activity") townships of Lambesc Peyrolles-en-Provence and Salon-de-Provence are the most exposed. Areas Ib ("low seismic activity") including the cantons of Aix-en-Provence, Trets Eyguières, Orgon, Berre-Pond, Istres, Istres-North and South, and Ia areas ("very low seismic activity") including the other cantons in the district of Aix-en-Provence, Arles-East, Châteaurenard, Saint-Rémy-de-Provence, Marignane, Martigues-East and Roquevaire-West, are least exposed. Zone 0 ("negligible seismic activity") includes the rest of the department. Since the Bouches-du-Rhône department is one of the most populous and diverse departments, it has long been the scene of particularly fierce political battles. The development of the Marseille-Fos Port, the relationship maintained between France and its colonial empire, the industry around coal mining in Provence, and significant immigration, especially coming from Italy, from the end the nineteenth century and during the period between the two wars are all factors that led to the emergence of a large and militant working class. From the late nineteenth century, the socialist movement gained influence, such as by in 1881 by the election of the first socialist member of France, Clovis Hugues. Rural areas, and particularly in the region of Aix have tended to favor the influence of right-wing parties, including monarchists and Catholics at the beginning of the French Third Republic. The interwar period and the time of the Popular Front marked the beginning of the dominance of the left in the department, first with the election of the SFIO. Map of the communes of the Bouches-du-Rhône department and the political majority of their municipal council since the French municipal elections, 2014. Grey signifies no political majority. 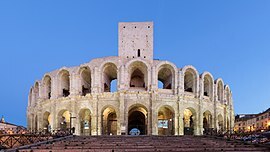 After the Second World War, the Marseillais right, linked to the underworld and who collaborated with the German occupation, was widely discredited. The left largely dominated the Liberation and Marseille even saw the election in 1945, of a Communist Mayor, Jean Cristofol. In 1947 the SFIO led an alliance with right and centre parties against the Communists, resulting in the election of Gaston Defferre as Mayor of Marseille. The dominance of socialism was, however, challenged by deindustrialization. The conservative success in 1995 by Jean-Claude Gaudin in Marseille is a symbol of widespread political shifts while even the communists bastions of La Ciotat and Port-Saint-Louis-du-Rhône voted for the right. The 1990s saw the rise of the National Front, including its victories in the municipal elections of Marignane and Vitrolles. The President of the Departmental Council is Martine Vassal of The Republicans party since 2015, after former Socialist President Jean-Noël Guérini was voted out of office and faces corruption charges. Bouches-du-Rhône's 2nd constituency Claire Pitollat La République En Marche! Bouches-du-Rhône's 3rd constituency Alexandra Louis La République En Marche! Bouches-du-Rhône's 5th constituency Cathy Racon-Bouzon La République En Marche! Bouches-du-Rhône's 7th constituency Saïd Ahamada La République En Marche! Bouches-du-Rhône's 8th constituency Jean-Marc Zulesi La République En Marche! Bouches-du-Rhône's 10th constituency François-Michel Lambert La République En Marche! Bouches-du-Rhône's 14th constituency Anne-Laurence Petel La République En Marche! Bouches-du-Rhône's 16th constituency Monica Michel La République En Marche! Below is a list of seats won by the department's different parties after the French departmental elections, 2015. The department has a Mediterranean climate, with contrasting temperatures within a range of 15 degrees. Precipitation is irregular, with only 65 days per year where rain falls in excess of 1 mm. However it falls in sudden downpours, with an average of 500–700 millimetres (20–28 inches) annually. This mainly happens in the spring and autumn; summer is very hot, winter mild. Violent winds are common, especially the famed mistral, which blows 100 days per year with a maximum of 100 km/h (62 mph). The coast is drier, especially along the Côte Bleue, the Calanques and the bay of La Ciotat, which include some of the driest areas in France, with only 450 mm (18 in) of rain per year. Higher areas receive more precipitation and lower temperatures. The Arc region in the interior is much colder than other areas, with heavy frosts in winter. The department is well represented in French art. 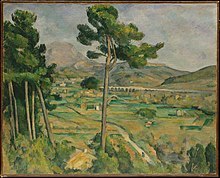 Paul Cézanne painted numerous representations of the Mont Sainte-Victoire. Vincent van Gogh spent two years in Arles, painting many scenes in the area. The department's main museums include the Museum of European and Mediterranean Civilisations, the Musée de la Faïence de Marseille and the Marseille History Museum. ^ Albert Ceccarelli, La Révolution à l’Isle sur la Sorgue et en Vaucluse, Éditions Scriba, 1989, 2-86736-018-8, p. 27. ^ Albert Ceccarelli, La Révolution..., p. 30. Wikisource has the text of the 1911 Encyclopædia Britannica article Bouches-du-Rhône.